WHILE most people were still finding their way into a new weekend, bloggers from the All Malaysian Bloggers Project (AMBP) were geared up for a journey to Perak to explore the hidden treasures of Kinta Valley. The ride to Papan was scenic with huge shady trees along the winding stream, mining ponds, a hill slope dotted with Chinese graves, a Kuan Yin temple, and, almost in the middle of nowhere, a brick and mortar streetscape of a ghost town – the remains of a nineteenth century mining town. Today, Papan is a one-road small town with two seemingly desolate rows of shop houses, some barely standing, along the street aptly called Main Road. Perak Heritage Society president Law Siak Hong took the bloggers around Papan to soak up the historical memories of the quaint town. One that was particularly fascinating was the story of Sybil Karthigasu. During World War II, the then Malaya was occupied by the Japanese and Sybil Karthigasu, a mid-wife based in Ipoh, together with her husband, Dr A.C. Karthigasu, set up a clinic in a shop house in Papan. There, Sybil risked her life by secretly helping the anti-Japanese guerillas. She gave them medical treatment and intelligence. Insightful: Low giving a briefing to the visitors on the history of Papan and the role of Sybil Kathigesu during the World War II. Despite being iterrogated and tortured by the Japanese military police, Sybil persisted in her efforts and was thrown in Batu Gajah jail. She survived the war and received the George Medal for Gallantry several months before her death in June, 1948. Today, the shop house at 74, Main Road, Papan, serves as a memorial to Sybil and her efforts. The bloggers were also taken to look at the house of Raja Bilah. The remarkable career of Raja Bilah as a miner-trader-adventurer gained the Sumatran nobleman respect as the leader of the Mandailings and headman of Papan. The magnificent house on the edge of Papan is set in a mysterious environment shrouded by forested hills and has been used as a set for various films. It was used by Oscar-winning production designer Luciana Arrighi for the movie Anna and the King (1999). Freelance photojournalist Joyce Tedoen, who blogs at http://joyce-tedoen.com and participated in the trip, said he loved snapping pictures of historical sites and sharing his memories with others. In fact, his blog posts are often accompanied by mesmerising photographs of the places that he visits. The bloggers also went to the Gopeng Museum, which is a shop house that has been transformed into a thematic museum depicting the history of the small town. Gopeng was once home to the largest tin mining industry in the world until the collapse of the tin empire in the 1980s. Today, the museum is home to many artefacts that have been rescued and retrieved from the people of the town. There are over 2,000 old photographs that show how Gopeng used to be a busy town during its glory days as part of the tin mining industry in Perak. Machines used to process rubber are also displayed at the museum together with tin mining materials. “The purpose of this museum is to revive the heritage value of Gopeng,” Gopeng Museum Management Society ad hoc committee secretary Phang See Kong said. The shop house itself has its own interesting story. It once belonged to Eu Kong, the founder of Eu Yan Sang, a renowned chain of herbal stores. In fact, the shop house was the very first Eu Yan Sang store. During their travels, the bloggers also visited Raja Bilah’s house. Music student Joanna Marie Gough, who was on the trip, said it was her first time in Papan and Gopeng despite the fact that she was from Ipoh. An avid blogger at http://thegentle-snail.blogspot.com, Gough is also a big fan of history as she believes that different people have different perceptions of what they see and feel. Fellow blogger Nigel Tee added that the experience in Perak had been educational as he had learnt a lot. Being a photography enthusiast, he documents all his adventures at http://blog.flymenigel.com. “This journey has actually shown me that there are still many places with rich historical memories in Malaysia just waiting to be discovered,” he said. The project was organised by Travel Tales (http://www.traveltales.biz/), a local travel agency for travellers seeking meaningful experiences in Asia, in collaboration with AMBP by The Star Online and AllMalaysia.info, a programme that aims to bring the blogging community together by organising various projects both online and in the real world. DUSTY, old, abandoned buildings – is there beauty in them? Yes, if you’re a heritage buff. Such buildings reek of history and there are many in the town of Gopeng. I’ve never quite seen this side of laidback Gopeng before though I often go there for a loh see fun (noodles) lunch at the hawker centre. But after I joined a Gopeng Heritage Walk organised by the Perak Heritage Society, I began to see the town in a new light. The half-day tour, led by society president Law Siak Hong, left me spellbound by its hidden charms. Law guided us in our search for dilapidated and abandoned shops. Some were wooden structures while the others were half-wood and half-cement. Most of them had been razed by fire but some of the structures were still standing. In 1886, fire gutted Gopeng, destroying 68 wooden shops. These were later rebuilt but many were left to rot. In 1997, fire again engulfed 12 old wooden shophouses in High Street. The causes of both these fires and other subsequent fires were not known. One shop razed by fire was the Straits Trading House built in 1889. But parts of the building are still standing. A block of shophouses in Wayang Lane occupies the site of the first theatre called Tan Kwai built in 1906. Demolished in 1970, it was replaced by some modern buildings. Law said many shops had two-colour tones as they were rebuilt using old and new materials after the fires. The Heritage Walk starts with a visit to an 80-year-old pre-war building that houses the Hup Teik Soya Sauce Factory. Here, visitors can learn more about the production of various soya-based products. Hup Teik is a Lau family business and its members will gladly show visitors how they produce black/white soya sauce, taucu, vinegar and other products. Just across the road from the factory are three rows of old houses called the Kampung Rawa houses, single-storey link houses with tiled roofs built in 1915 for workers of tin mines. The Rawa people were once immigrants from Indonesia. As you leave the area, you will see abandoned public amenities including wooden houses that served as Government quarters in the old days. The next stop is Wayang Lane in the town centre where there is a roundabout that used to be the site of an old market. The neighbourhood was once a choice residential area for wealthy Hokkien mine owners around 1878.Another must-see in town is the Tsen Lung Hakka Association building. The Hakkas are a prominent clan in Gopeng and the founding patron of the association, Kapitan Chung Keng Kwee, is still revered. The association is the only traditional Hakka-style building still standing in the Kinta district, though some renovations have been made. A red plaque, believed to be the oldest item of calligraphy in Kinta district, can be seen at the entrance. Next is the Masjid Jamik, built by Mandailing shopkeepers in 1890s and rebuilt in 1927. The Mandailing from Indonesia, came to the foothills of Gopeng and founded Kampung Sungai Itek where they continued to live till today. Another Chinese association worth a visit is the Keng Chow Hainanese building, with its collection of Chinese artefacts including a 107-year-old bell, a bridge seater (qui) and altar. There’s also the oldest Chinese temple in the Kinta Valley here, the Kuan Yin Temple, dedicated to the Goddess of Mercy. Built in 1892, and renovated in 2006, it showcases numerous epigraphic plaques contributed by Cantonese groups such as the Lam Hooi, San Woi, Ku Kong Chow and Hock San. Visitors throng the temple during festivals to perform prayers as well as watch opera shows at the outdoor stage. The Sikhs have also made their presence felt and they built the Gurdwara Sahib in 1988. Many Sikhs are still part of the Gopeng police force. Some fine-looking shophouses can be seen along High Street, Jalan Eu Kong, Jalan Pasar and Jalan Kay Loong. These have intricate grill doors, gates and air wells. A row of shophouses here is called “Mistress Houses” as this was where the rich men housed their concubines in the 1970s. Another heritage trail covers the Gopeng Homestay programme. Three traditional villages — Kampung Sungai Itek, Kampung Pintu Padang and Kampung Jelintuh — located 2.5km from Gopeng, offer a cultural experience of the people especially the Rawa who will showcase their culture, food and traditional games. The Semai Orang Alsi also live in villages near Gopeng. Some of them marry into the families of Sumatera from Indonesia who have settled in the villages, as well as the Chinese and Malays. The Semai, who live in villages along the fringe of the jungle, will often come to town to sell jungle and farm produce like vegetables and fruit, especially durian. How did Gopeng get its name? Story has it that Sultan Jaafar of Perak ordered a Chinese man named Mo Peng to open tin mines in a nameless spot in the old days. So Mo Peng arrived with his workers and since the place didn’t have a name, he called it Mo Peng after himself. Over time, it was pronounced as Gopeng. The town dates back some 150 years and is older than Ipoh, Perak’s capital city. This is evident from the shrine of the late Raja Bendahara Ayang Iskandar. 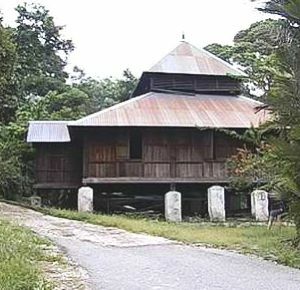 Located in the old town of Kota Bharu, near Gopeng, it carries an inscription indicating that he headed the administration of the “mukim” from 1851 to 1861. Six indigenous people settled in Gopeng — the Malays, Semai, Rawa, Mandailing, Chinese and Indian. For decades, Gopeng was under the administration of European officers, merchants and engineers, as well as the Chinese under the leadership of Eu Family and the Sumatrans under its assistant penghulu, Iman Prang Ja Barumun. Today, Gopeng has 21 Orang Asli settlements, 28 Malay Villages and 50 residential gardens. Take the North-South Plus Highway. Exit at Gopeng toll plaza. It’s about 40 minutes’ drive from Ipoh and about 1½ hours from Kuala Lumpur. For details of Gopeng Heritage Trail tour, email: perakheritage36@gmail.com. To join the homestay programme, call 05-242 7277. GOPENG Museum, which opened on World Heritage Day (April 18) this year, was the brainchild of Bernard Yaw, with support from the residents. Finally, there is a place to learn more about the town’s history. Gopeng-born Yaw, 49, a businessman living in the United States, had long harboured a desire to share the rich legacies of his hometown, especially with the younger generations. The museum is in 28 Jalan Eu Kong, a double-storey brick shophouse built in 1882 by Eu Kong, founder of Eu Yan Sang. In 1887, Eu gave Yaw’s ancestor, Yaw Mun Chong, a lease on the property and in 1999, Yaw, the fifth generation, bought over the house. 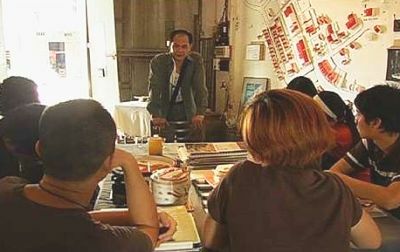 Local historian Pang Sai Hong helped to create a permanent exhibition of historical images and objects focusing on the town that was built on tin and rubber. On display are 300 artefacts including old furniture, coins, typewriters, cameras, uniforms and a harmonium air organ. Some of the items date back over 100 years old, and are contributed by the locals. The museum is open daily from 9am to 6pm. Details, call: 017-578 5185.